Our match against the Shamrocks saw the boys venture far from the familiar eastern Sydney coastline to face a well-prepared and confidant Dundas outfit. The Shamrocks, who were sitting with us in equal third position on the ladder, showed nothing of the characteristics of a small young sprig that their mascot would suggest, came out breathing fire and posted the first points of the match. But displaying the composure our team has developed over the past eight weeks, our boys steadied the ship and on the back of the foundation laid by the likes of Cy and the very busy Julian up front, wrestled their way back into the contest and into the lead by the halftime break. In the second half, the Colts orchestrated a number of effective plays around the ruck to build pressure and with that our scoresheet. However, missed tackles and silly errors kept Dundas in the contest, which nearly cost us the game. In the end, we got away with a valuable if not a dazzling victory. Key takeaways from the match include our ability to grind out a victory even when we don't play our best football, discovering fire ants have escaped their exclusion zone in Queensland and taken up residence in the Dundas Valley, and never let a Victorian now living in Sydney's eastern suburbs drive you into Sydney's western suburbs. Special mentions include Peter who maintained our width in attack and ran with real purpose whenever he got the chance, and Harry, who played with a broken toe and deservedly picked up the John Sattler Award for bravery. 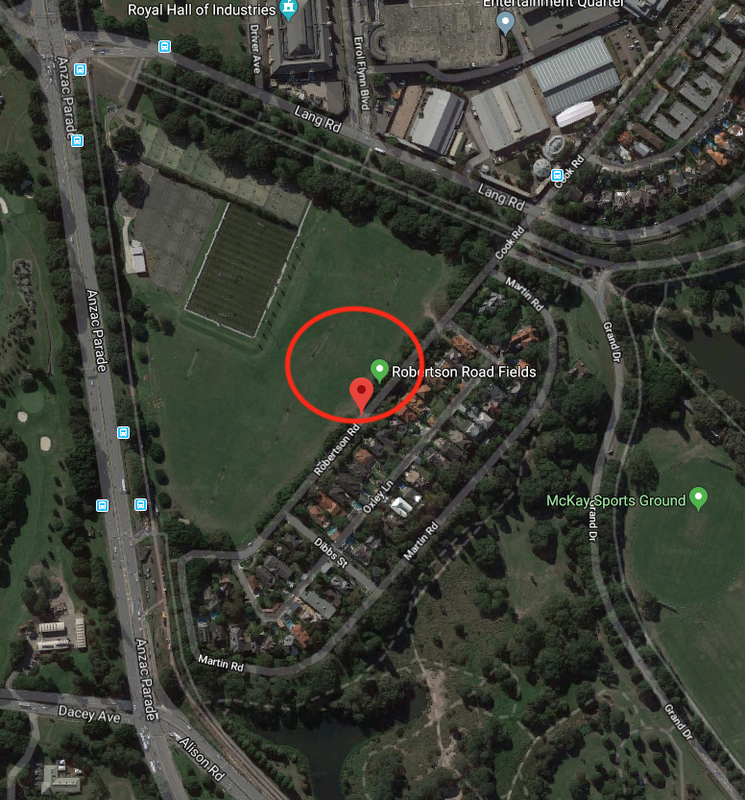 Back at Burrows Park, the home of rugby league, our match against St Charles loomed as a defining game for the team, as both teams were locked in second place on the ladder and marked the point in the season where all teams had (in theory) locked horns at least once. The game itself was a terrific game to watch and I was really impressed with how all boys were eager to get involved both in attack and defence. St Charles has some great players, with a good balance of strength and size in the middle of the park and genuine speed out wide. It certainly required our boys to be switched on and be prepared to work their way into the game. Our forwards ran the ball with gusto, avoiding some spirited early defence from St Charles and earning us valuable field position which we converted into points. Jasper did well in organising our attack in the first half, highlighted by a sweeping backline movement that set Kubi racing away for a well-constructed four-pointer. 'Champagne rugby league' was how it was described from a nearby onlooker as he smashed his way through a steaming hot 'four n twenty'. As the second half progressed, our boys gained the ascendancy and kept the scoreboard ticking over. We took the opportunity to execute a few attacking kicks and offloads between the forwards, and we seemed more willing to pass the ball wide. We are certainly trying to encourage the boys to catch, look and pass, and exploit some of the great speed we have in our outside backs. Some scintillating line breaks by several players including Jamie capped off an impressive all-round performance from the young Colts. Special mention to Max O who played his best game so far this season and made several strong runs, and Alex Da Beast Vesper who showed great mental aptitude to withstand the mind games from his St Charles schoolmates. Finally, congratulations to Jasper for picking up the Solo Man Man Can this week. Keep an eye on Team App for details about our next match. Creating memories forever, Mates for life big banter and bragging rights. Well he played at age 6 to 16 the club folded in the year 2000. RYAN then played again in 2018 at 38 in our A Grade showing what toughness strength discipline and club loyalty are all about. It’s a been a great 1st 2 weeks for our club thanks to all our players parents coaches officials and hardworking Colts family. 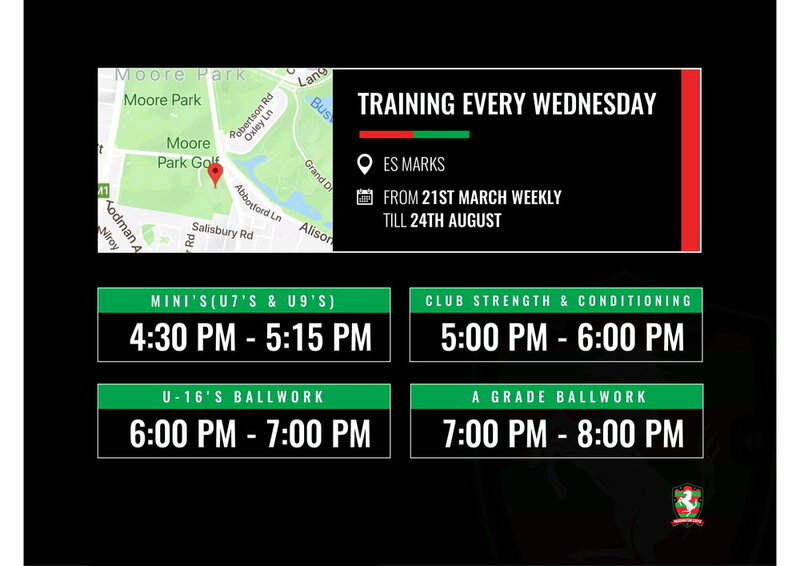 Please note today’s training at Robertson Rd has been cancelled due to the rain, the ground is closed. 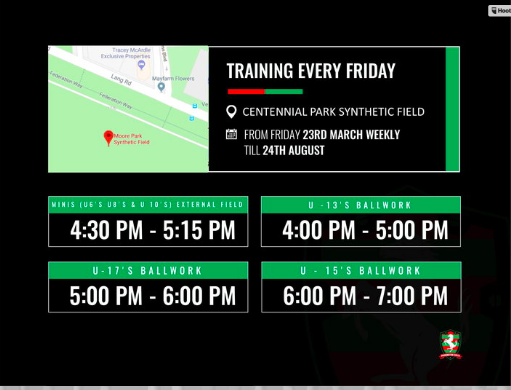 Please also note, this completes our summer training and we begin winter training as of next week Wednesday and Friday. At ES Marks on Wednesday and on Friday at Centennial Park Synthetic field. Please see attached training flyers. Reminder winter training Wednesday at ES Marks 4:30-7:30pm and Friday Centennial Park Synthetic field 4:30-7:30pm. What can I say - one of the most exciting games of the season! 13 tries each in our 2nd tied match for the year. (Coincidentally the 1st tied match was back in Round 7 against the same team with 12 tries apiece). Well Done Boys!!!!! 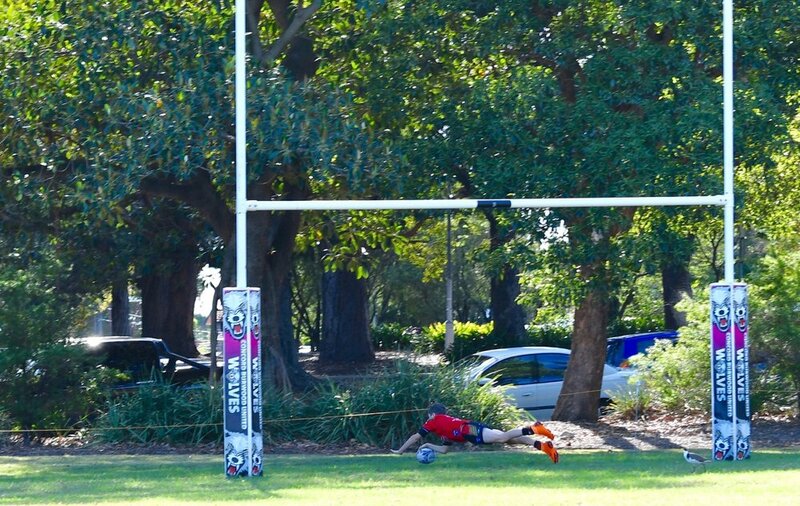 Billy Walker - Billy scored an impressive 4 tries this week - his highest count to date. All round excellent tackling and defence, which he has shown consistently week after week. Our Player of the Match this week. I think you'll be able to shout the fam Maccas with that pile of awards you're amassing! Cash Parry - Another consistent effort from Cash, managing to score 3 tries and was again outstanding in defence. A confident player with steely determination...I'm scared just looking at you in case I get mowed over! Koa Kelk - A little hesitation here and there, a twirl and a tapdance almost.....but Koa scores a try! Top effort with some good defence and group tackling. Brock Dalley - After some impressive downhill skiing last week, Brock was back in his element on level ground following his team in tackling and putting in 100% with defence. The happiest boy you've ever seen when he has the ball, and giving several good runs this week. Leo Lynch - Leo our little no.6 was out this week with a tummy bug. Hope you are feeling better soon ready to run around with your mates next week. E.T. - Our fearless ET was again in his element running after the opposition with determination and speed. 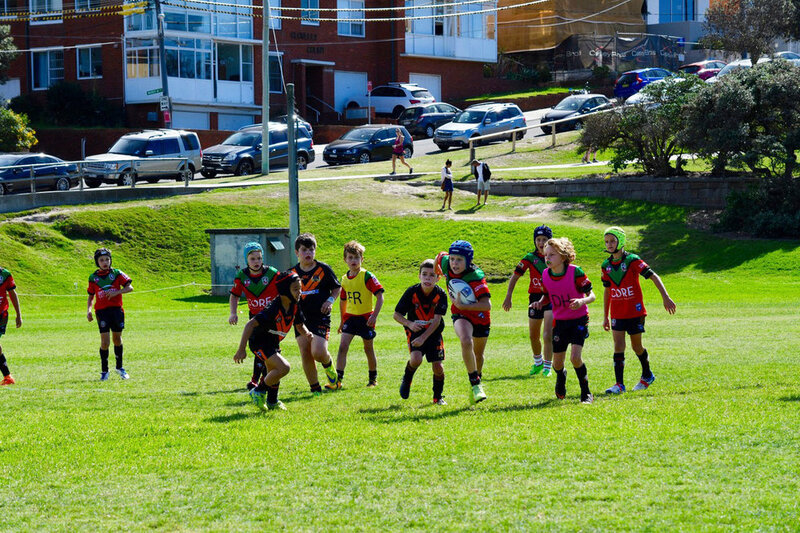 One of our first lines of defence saw ET chasing down the other team whenever the opportunity arose. 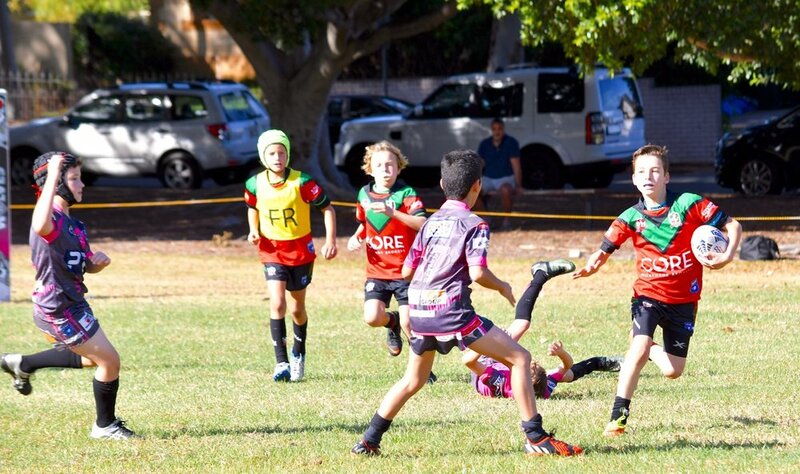 A fantastic try by ET evading the other team with ease! Odin Goyoaga - After a pep talk from dad Odin was tackling anything wearing a United jersey this week. 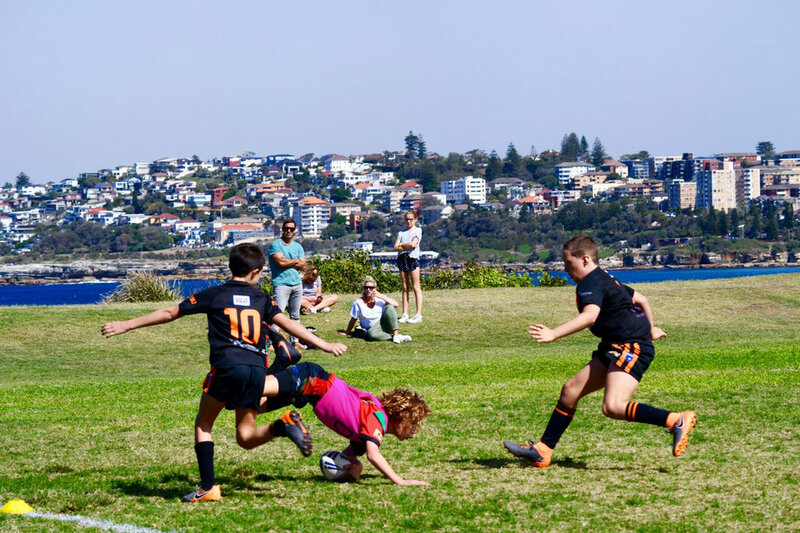 Scoring our first try of the match leaving the opposition choking on his dust...he added 3 more tries,either leaving United bumping into one another halfway down the field, or slipping through the cracks of the Whites! Hmmm playing one of his best games ever when dad's not there. Was that deliberate?? Haha hubby - YOU MISSED IT ALL!! Our Merit Award recipient this week. 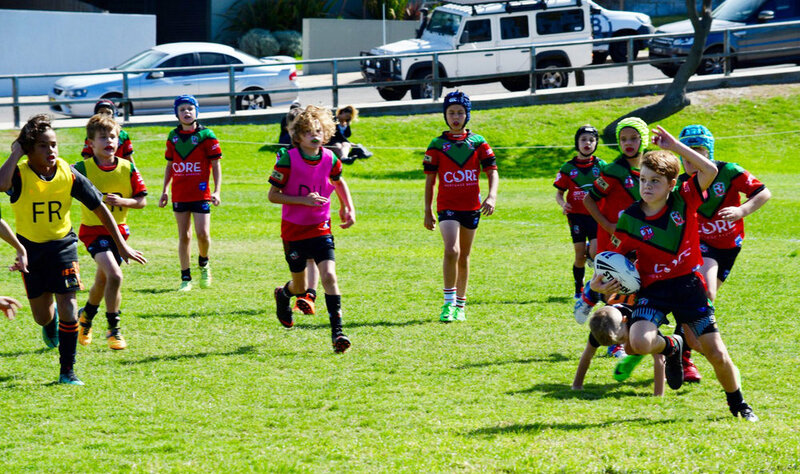 Tane Goyoaga - Some great tackling from our little No.15...but mum doesn't like being ambushed 20+ times by jumping on her back ...but it's nice that little Rocky Walker wanted to practise similar skills on his mum, thankfully less enthusiastically. (Know any good physios Brigitta?) Not fussed too much on oranges this week and only one bag of chips today. Odd....Not your best effort son!! Well done again boys...... Our games are getting better and better each week. Have a great weekend peeps - enjoy the 26 Deg C winter day! 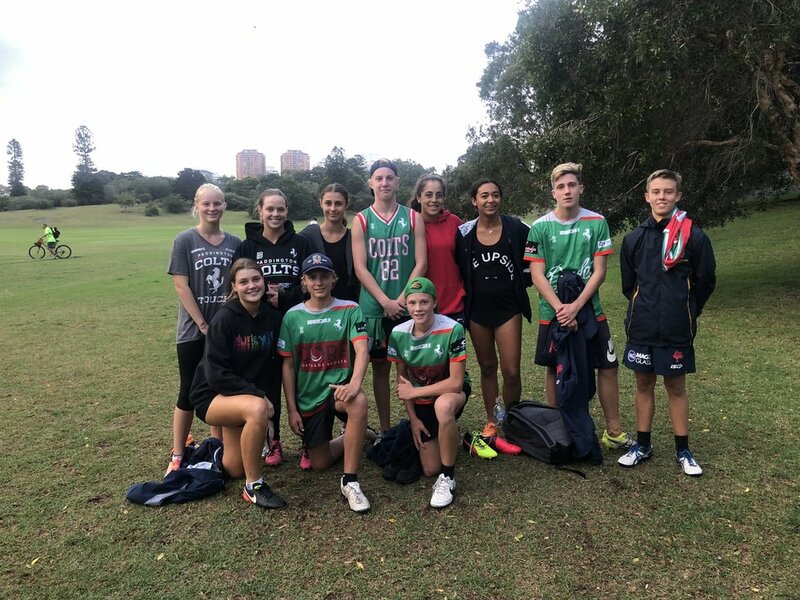 A cracking morning saw the young colts take on arch rivals Bondi United, down 4 players our boys got plenty of game time and didn’t disappoint the big crowd with a tough 64 to 60 win. It was a try feast with all the boys crossing the white line.Young Kai and Geoff both bagging their first doubles. Rocky and Charlie both played strong as always in both attack and defence. Special man of the match performances went to Harley Stevenson with huge running meters, bagged 4 tries and scored on the bell to seal the win and and Beau Clark who pulled off some inspirational Scott Sattler like cover defence from his new faviurite position at full back. We welcome back some of our stalwarts next week and cant wait to do it all again. Who are who are who are we! We've won our first Game out of our last 4!!!!! 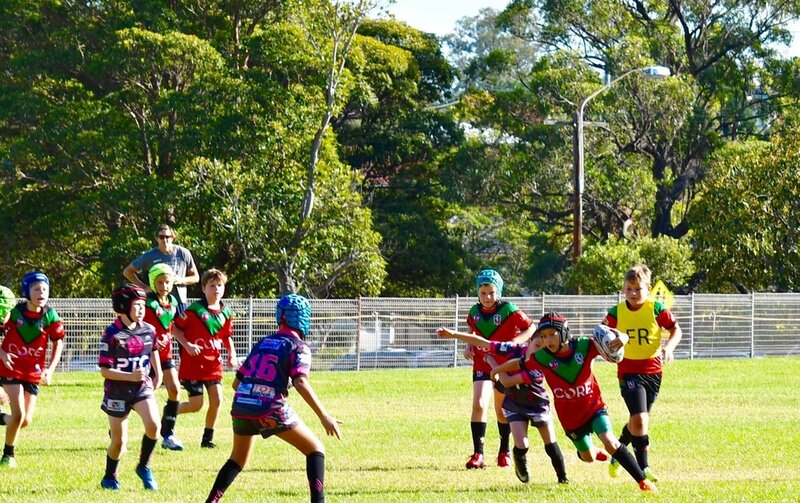 Paddo Colts U6s won 10 tries to Clovelly Crocs 9 to come away with our first win in our last 4 games....... Well Done Boys!!!!! (My star try recorder, Summer was away, so hopefully my count is correct ). 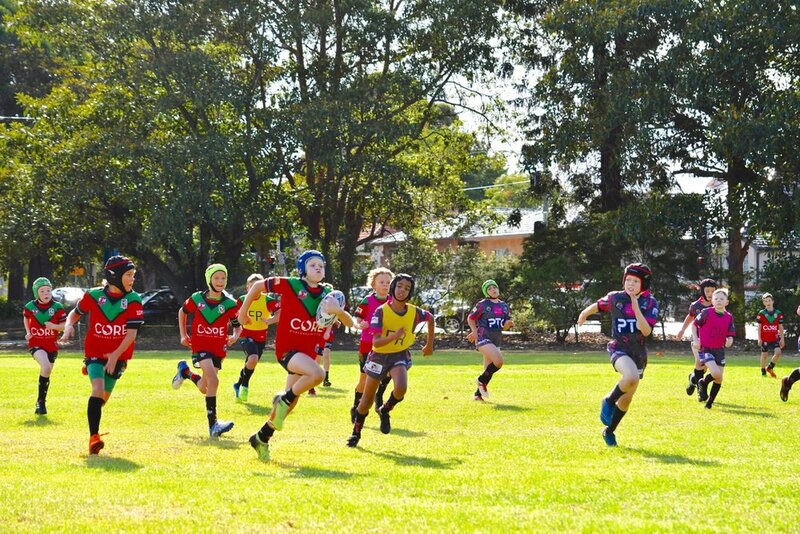 Cash 'Beatso' Parry - Has evolved into one of our strongest players .... Cash was again outstanding in defence showing great technique to bring down the Crocs attackers...... Cash made several strong runs really believing in his size and strength to score 3 great tries. One of his best games to date..... Great Game Cash!!!! Koa 'The Handstand Kid' Kelk - Koa did well this week running to the gaps where Paul said to run..... Making several great runs unfortunately the Crocs defence was to quick for Koa..... Koa kept up his good defence and didn't run away from the Crocs attackers..... Koa received this weeks Merit Award for his effort..... Well Done Koa!!!!! Brock 'Oh What a Feeling' Dalley - Trained really well on Friday..... The Roosters Footy Clinic must have done wonders..... Brock is down the snow at the moment doing a snow photo shoot..... How are the snow bunnies Brock????? Well Done Brock, Let's see those skills in the Game!!!! Leo 'The Lion Heart' Lynch - Leo made several impressive runs again this week..... Leo has continued showing us how big his heart is making several great tackles. Keep it up Leo!!!!! Odin 'The Swerver' Goyoaga - Odin played well this week and kept up his try scoring average continuing where he left off before the holidays scoring 3 great tries with his speed and evasive runs..... Odin did at least have a go in defence this week getting involved and making several try assists..... Well done son!!!! All smiles today for our mighty under 7s!! The boys played with great spirit and determination. The team song never sounded so sweet!